“It makes a difference,” Pearl said. It’s about taking fans on the road. We’ve got to create a great home-court advantage… one of the ways to change perceptions is when your fans start to travel.” Pearl went on to say he valued the opportunity to speak directly with fans & alumni. Pearl spoke to club members and guests on a number of topics, from fan support to the future of the program, and afterward fielded questions from the attendees. 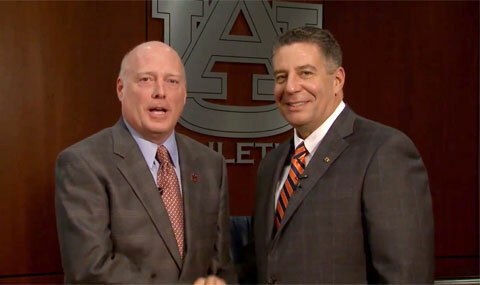 Watch the following video where voice of the Tigers, Rod Bramblett, speaks with Auburn’s new head men’s basketball coach, Bruce Pearl, in his first interview at Auburn. Rotary Club members and guests filled nearly every table at the Saugahatchee Country Club, with many of them taking the opportunity to greet Pearl after his keynote. The luncheon turned out to be a huge success, with the club attracting it’s biggest crowd all-year. Bruce Pearl is currently the head coach of the Auburn Tigers men’s basketball program. He previously served as the head coach of the University of Tennessee Volunteers men’s team, among others. If you would like to book pro athletes or basketball coaches like Bruce Pearl for a speaking engagement, autograph signing, personal appearance or special event, you can contact Bruce Pearl’s agent for speaker fees at PFP Talent Agency or call 800.966.1380.